Rep. Kathy Rapp (R-Warren/McKean/Forest) accepted her fourth consecutive Guardian of Small Business Award from Pennsylvania National Federation of Independent Business (NFIB) State Director Kevin Shivers. 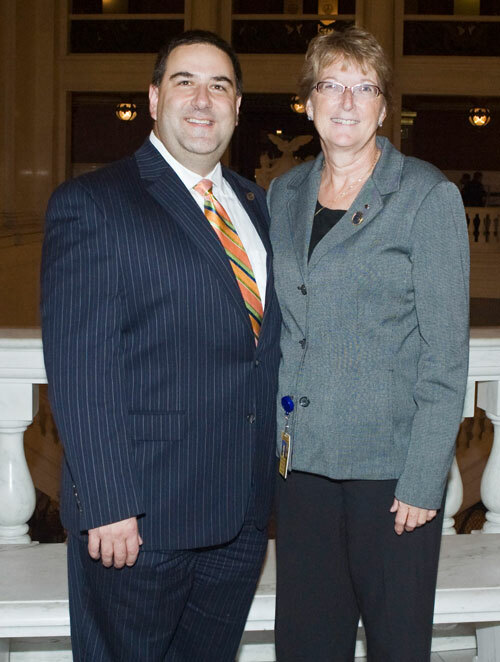 HARRISBURG – Rep. Kathy Rapp (R-Warren/McKean/Forest) has once again been recognized as a Guardian of Small Business by the Pennsylvania chapter of the National Federation of Independent Businesses (NFIB) for her outstanding voting record on pro-business legislation during the 2011-12 legislative session. “Guardians of Small Business” designations are awarded to legislators who consistently vote favorably on key small business issues. The votes tracked this session are among the highest priorities of NFIB’s small business agenda -- legal reform and regulatory relief, tax and fiscal policy, and unemployment and workers compensation reforms. This is Rapp’s fourth consecutive Guardian of Small Business award since first taking office in January 2005. For the latest legislative updates, visit www.RepRapp.com.